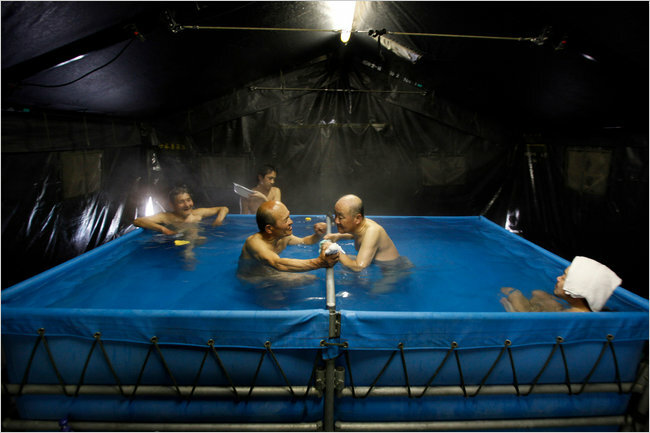 Residents in Yamamoto in Miyagi Prefecture, relaxed in a makeshift public bath set up outside a shelter for tsunami and earthquake victims. KIKUZENTAKATA, Japan — Koji Yamaguchi, a 76-year-old survivor of the tsunami that all but eradicated this town on March 11, was unavailable for interviews. He was out walking his dog. Which would be unsurprising, were Mr. Yamaguchi not an evacuee himself, living on a 9-by-9-foot grass mat in a junior high school gymnasium here with 1,000 other people. To an outsider, much is striking about Japan’s response to two weeks of serial disasters: the stoicism and self-sacrifice; the quiet bravery in the face of tragedy that seems almost woven into the national character. Just as striking, however, is that evacuees here live in a place that can kennel your dog, charge your cellphone, fix your dentures and even provide that nonnegotiable necessity of Japanese life, a steamy soak in a hot tub of water. Theirs is a city where a hand sanitizer sits on every table; where face masks, which Japanese wear the way other people wear sunglasses, are dispensed by the box. It is a place where you do not just trade your muddy shoes for slippers at the front door, but also shed the slippers at the gymnasium door lest you carry a mote of dust from the hallways into the living areas. None of this is to suggest that Takada Junior High is the Waldorf. There is immense suffering and personal misery here: grieving survivors, financial ruin, smelly bodies, no running water, frigid outdoor toilets, endless boredom and the prospect of sleeping on a hard floor with complete strangers for weeks — even months — to come. But this, too, seems to be part of the national character: a passion for order and civility so deep-rooted that the chaos and despair of 1,000 strangers somehow is subdued to the level of disarray expected at the monthly meeting of a book-lovers’ club. The messages are lived in simple ways. One expects that 1,000 evacuees would have access to a doctor, and the Japan Red Cross has opened a well-staffed clinic on the first floor. But one might not expect the two dentists next door, who decided on March 17 to volunteer their services and opened shop the next day, treating about 15 patients daily with the help of staff members whose own homes were lost in the tsunami. Hair cutting and dentistry joined a long list of services, donated and otherwise: volunteer bicycle-repairing, a shuttle bus ferrying evacuees from center to center, pet cages donated by local veterinarians, free laundering of refugees’ clothes by local high-school students. Drying remains a problem. “We have to dry the ladies’ underwear where people can’t see it. So we put it in two classrooms on the second floor, and then we lock the doors,” said Mr. Nakai, the evacuee center manager. Classes at the school have been suspended since the disaster. Ms. Sasaki staffs the help desk in the gymnasium, the urban center of this makeshift town. To the right is the lending library. To the left is a cardboard mailbox where evacuees can deposit postcards — also available at the desk — that are delivered to other centers around town. Opposite her desk are recycling bins for burnable trash, plastic, glass and metal (subdivided into aluminum and steel). On the desk and adjacent shelves, free for the asking, are batteries, hand and foot warmers, cotton gloves, pens and paper, plastic trash bags and eye drops for the tree pollen that is spreading with the arrival of spring. A small box holds cellphones that have been charged at the power strip behind her chair. Beside the chair is a wireless microphone used to deliver the news through the gymnasium’s sound system, heralded by the four-chime alert often heard in train stations and airports. This week, Japan’s Self Defense Force soldiers offered a much-coveted new service: two hot tubs for men and women, holding 25 bathers at a time, at a nearly elementary school that also houses evacuees. Now the Takada center offers daily shuttle buses to the tubs, which sit side by side in steam-saturated tents outside the school entrance. The orderliness extends to the residents, who have assembled the detritus of two weeks on a gym floor — donated clothes, blankets, folding chairs — into neat barriers that provide a modicum of privacy from the neighbors. The gym floor is carved into neighborhoods, each with a representative who carries grievances to higher-ups. Not that there are any grievances, of course — at least those that people are willing to admit publicly in a culture that prizes the capacity for endurance. “Some people gather around the space heater at nights because they can’t sleep. The young people, especially, snore really loudly,” said Yukiko Yamaguchi, 73, who lost her home in the tsunami.